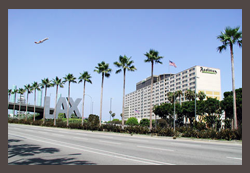 Welcome to the LaxHotels.We are your single source for hotel listings near Los Angeles International Airport. We offer over 25 hotels and accommodations near the airport. LAX hotel reservations start here. We are the traveler's source for discounted hotel rates around the airport. Whether you're on a budget, traveling with your family on vacation or visiting on business, our airport hotel guides will help you find the accommodations that suit your specific needs. 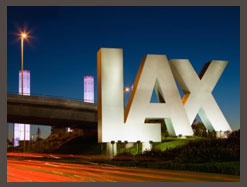 Los Angeles International Airport (LAX) is one of the busiest airports in the world. 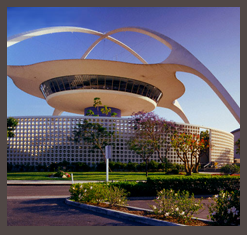 Located on the southern coast of California, LAX handles thousands of domestic and international commercial flights every year. International freight accounts for 50% of the annual tonnage that passes through LAX. With its increasingly expanding air cargo system, Los Angeles International Airport is a commerce leader, benefiting from modern facilities and excellent land, sea and air links. The closest hotel to Los Angeles Airport, just one block east of Terminal number 1,the recently-renovated Hotel at Los Angeles Airport provides the comfort and quality that appeals to business and leisure travelers alike. The spacious, refurbished rooms and suites at the Radisson Los Angeles Airport are appointed with such state-of-the-art technology as High-Speed Internet Access, two-line telephones with data port and speakerphone capability. Other in-room amenities at the Radisson Los Angeles Airport include Coffee makers, irons, boardsand our new Sleep Number® Beds exclusively at Radisson, you can adjust the bed to your exact comfort level, for a more restful sleep. When it's time to relax, guests at the Hotel at Los Angeles Airport can enjoy an Olympic-sized swimming pool, Fitness Center and such spa services as massages and pedicures. Other conveniences offered by the Hotel at Los Angeles Airport include on-site parking, ($15.00 valet and $12.00 self) concierge desk and complimentary newspaper.